When it comes to the mini-tablet market, Barnes & Noble's Nook HD often seems to be the forgotten player. It shouldn't be. There's a lot to like about the new tablet. The Nook HD is smaller than Apple's iPad Mini and almost as light. Its high-resolution screen puts the iPad Mini's to shame and is even sharper than the one on Amazon's Kindle Fire HD. If you're looking for something to read on your tablet, Barnes & Noble has a much larger selection of eBooks in its store than you'll find in Amazon's Kindle store. And if you want access to lots of applications or movies on your device - say, while on a trip - the Nook HD allows you to plug in a memory card to expand its storage space. That's something you can't do on the iPad Mini, the Kindle Fire HD or Google's Nexus 7. And best of all, Barnes & Noble offers the Nook HD at a low price. Its $200 starting price is the same as those for Amazon and Google's mini-tablets - and $130 less than what you'd pay for the iPad Mini. Don't get me wrong; it's not perfect. Its plastic case, for example, feels cheap. Its display, though, is gorgeous. Graphic novels, movies and magazines look sharp and stunning on it. Like the Kindle Fire, the Nook HD runs a heavily customized version of Google's Android operating system. 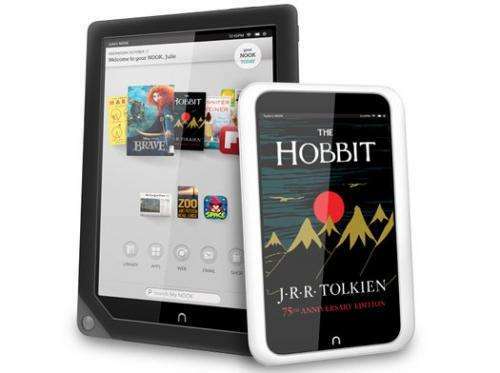 Barnes & Noble clearly sees the Nook HD primarily as a device on which to consume content rather than produce it, and the tablet's interface is designed with that in mind. On the Nook HD's home screen, individual books and movies get equal billing with apps; you can link directly to them rather than having to go through an e-reader app or a movie player. Like other tablets, the Nook HD has a link on its home screen to a folder containing all your applications. Unlike many other tablets, the Nook HD also has a link to your "library" of movies, books, magazines and other content. One potentially great feature of the Nook HD is that it allows owners to easily customize it for multiple users. Each can have his or her own home screen, and the device remembers each user's separate list of recently used applications and their place in recently read books. Users can also create profiles for kids that limit what they can do on the device. For example, children can be blocked from surfing the Web, or their profiles can be set so that only kid-friendly content or applications are visible. But the profile feature is incomplete. You can link the Nook HD to only one Barnes & Noble account, which can be a problem if you and your wife or roommate use separate accounts. It also means that any purchases made by secondary profiles are placed on the main user's account. Worse, you can set only one passcode for the device. So, as long as you know the passcode, you can access any of the profiles; good luck trying to keep anything private that way. The Nook HD has other shortcomings. In my testing, it felt sluggish at times. I had to wait a beat or two for it to rotate its screen or turn pages in some of the graphic novels I perused. Unlike many of its competitors, the Nook HD doesn't have any cameras. So you can't use it to take pictures or for video calls. And while you can expand its memory, the Nook HD comes with less memory built in than its comparably priced competitors. And while Barnes & Noble offers a great selection of books, magazines and movies, it doesn't sell music at all, and its selection of apps and TV shows is poor. Of the top 10 TV seasons available on iTunes, you'll find only two in the Nook store. Of the top 25 paid apps designed for the iPad, only seven are available for the Nook HD. And only one of the top 25 free iPad apps is available for the Nook HD. But to some consumers, many of those shortcomings may not matter. For those who mainly want to use a tablet to surf the Web, read books and magazines and watch movies, the Nook HD, with its low price and great screen, is a fine choice. More information: Troy Wolverton is a technology columnist for the San Jose Mercury News. Some of the Best After Christmas Sales on Android Tablets are at a site called TabletSprint -- the Novo 10 Hero is available at $219 -- possibly the best 10-inch tablet available this year under $300, and features a High Resolution 1280x800 IPS screen, 16GB Memory, a strong Battery(8000 MHz) and Dual Core processor with Quad Core GPU, both front and back cameras, MicroSD Memory Card slot with unlimited storage, Android 4.1 Jelly Bean Operating System, Google Play preinstalled with access to 400K Apps, MicroUSB port for connection to printers and other electronic devices, HDMI - to view personal videos and to download movies and watch in Full 1080p (HD) on to a large screen TV, WiFi, Bluetooth, Ethernet, and an option for 3G/4G connection. It's also a great gaming device with its high resolution screen and motion sensor. The manufacturer, Ainol Electronics received a "Best Tablet of the Year" award at CNET Consumer Electronics Show 2012.